The beloved Dr.Seuss's birthday is this week. This week is also Read Across America which is a reading initative sponsored by the National Education Assocation. Many schools, libraries, communities, stores, and families will be celebrating reading and Dr. Seuss books this week. It is so good so good you see. "Willy Waterloo washes Warren Wiggins who is washing Waldo Woo" That can be a mouthful for mommy, but we mutter through it. I did love Dr. Seuss's ABC as a kid. Great early reader for introducing concept words like left, right, up, down, high, low, etc. Mr. Brown can moo, Can You? Oh, the many many sounds Mr. Brown can do. He can moo, he can whisper, he can make thunder. The boys love to join in and make the sounds as I read this favorite. 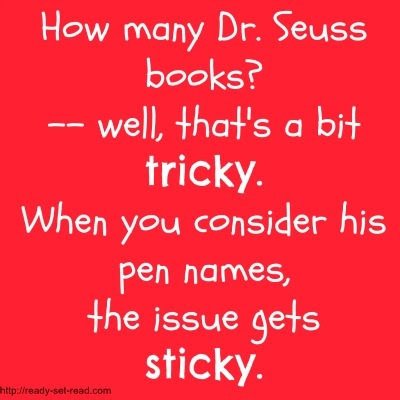 How many Dr. Seuss books written by Theodore Seuss Geisel are there? There are 52 books that were published under the name Dr. Seuss. The first one, And to Think I Saw it on Mulberry Street was written in 1937. The last one Hooray for Diffendoofer Day was written in 1998-- which was after Seuss died. According to Wikipedia, this book was published under his name but was written by using sketches he had made. This Wikipedia article lists all of the books that were written under the name Dr. Seuss, Theo LeSieg and Rosetta Stone-- all of his pen names. They attribute "over 60 books" to Theodore Seuss Geisel. Which of the 60 books are favorites in your home? What fun! I love Dr. Seuss! As a kid my favorites were: The Book about ME, The Cat and the Hat, and Wacky Wednesday. Sammy's favorites: Green Eggs and Ham since it has his name in it, Oh Say Can you Say (because its hard for Mommy to read), and Ten Apples Up on Top! I can't tell you how many times I've read the books you've mentioned when K was younger. Now, she's reading the older versions of Dr. Seuss by herself and loving them. He really had a way of reaching young children. As an adult, I find The Cat in the Hat downright spooky, but I still think Dr Seuss' birthday is such a cause for celebration! Anything that lights up kids' eyes about reading has my vote. Thanks for joining WMCIR! All the books you mentioned were favorites in our house too. My favorite is actually Lorax, but Anna is scared by it. She likes more whimsical stories like If I Ran the Zoo and Oh To Think What I Saw On the Mulberry Street.